In the following figure (red part of Vega's spectrum), the spectral profile is typical of what is available after extraction. This spectrum has been obtained with a 600 grooves/mm grating for an approximate resolution of R=1500. An important step is to replace pixel numbers by wavelengths along the X axis. This operation is called spectral calibration (i.e. fix the wavelength zero point of the dispersion curve). The line in the center (around pixel # 360) is the H-alpha line. The line in the neighbourhood of pixel number 550 originates in the terrestrial atmosphere (O2). It is in fact a molecular band. The next graph show an experimental spectrum of a domestic neon lamp (sampling of 1.44 A/pixel). Wavelength are in angstroms. Click here for a description of the spectrograph used. Next graph: a commented version of the neon spectrum. Click on the image for enlarge. 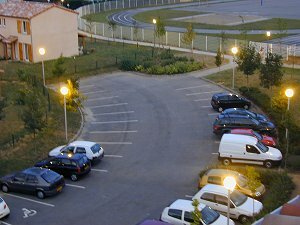 The sky light pollution of my city - High Pressure Sodium lamp types (Castanet Tolosan - France). The telescope is pointed toward a far street lamp. Note the intense absorption around the sodium D lines (self-absorption phenomena): the Fraunhofer absorption occurs inside the tube, along with the very broad wings of Na I 5890-5896 lines. Other emission lines are in the infrared part (not show here) : K1 doublet at 7665-7699 angstroms, and intense Na I doublet at 8183-8195 angstroms. The street lamps can be used for spectral calibration: it is the only advantage ! HPS street lamp view from my balcony observatory (Castanet-Tolosan observatory) ! The near infrared night sky of Castanet-Tolosan observatory. The sky line emission background is here detected during an observation of SS433 object with a LISA spectrograph (IR version - R = 800). 6000 exposure (10 x 600 s) on a C11 telescope. For more informations about microquasar SS433 click here. Click on the image for enlarge. Hight contrast 2D spectrum of SS433. Click on the image for enlarge. Negative view of SS433 spectrum. The infrared spectrum is dominated by OH rotation-vibration bands. You can note also the intense city pollution doublet at 8183 & 8195 A. Click on the image for enlarge. Emission lines identification in the sky background of SS433 spectrum. "blue" labeled line are artificial (HPS lamps). Note the telluric airglow emisssion at 6300 A and the rich atmospheric OH spectrum. Click on the image for enlarge. Of course, the star's proper lines can be used as a spectral reference if they are identified beyond doubt. The following image shows the spectral signature for Arcturus (type K2III) in the blue part of the spectrum. The H et K lines for ionized calcium are easily recognized because of their mere intensity. When there is no slit (or a large slit) and their are few stellar lines, scaling must be done using the telluric lines available in the atmosphere. In the following figure the red part of Vega's spectrum is shown, enhanced by the main atmospheric bands in the near infrared. Note that these atmospheric bands have a rather complex fine structure, and that one should be fairly prudent about their use. The next figure shows the resonance spectrum for O2 et H2O, extracted from a spectral databank of the earth's atmosphere.